Looking For the Bluetooth keyboard under $30 here we have our favorite Keyboard. Logitech K380 one of the best selling and budget friendly wireless keyboard available in the market right now. The world is changing so fast in the blink of an eye; technology has become a huge part of our daily lives which makes our life easier. As we know, man and technology have always depended on each other. It has changed the way of our living and has evolved in many ways. People are always trying to find something new that will improve our lives dramatically, and yes some of those creations have changed our lives, so let me introduce to you Logitech K380 Wireless Keyboard one of the best and affordable technologies available in the market right now let me give you a brief explanation. Technologies have been evolving since mankind. As for us, humans evolved so did technologies. One of the greatest and game-changing invention of all time were computers. In 1800 we invented keyboards now in 2017 lot has changed. Keyboards has turned into a whole new level like Logitech k380 wireless keyboard. Every piece of technology is beautiful on its way. There are many keyboards with unique features available to us, but what makes Logitech K380 different from others? let’s find out. 2x AAA Battery can give you 24 months of battery life it depends on your usage. 3 Bluetooth channel LEDs are available to indicate the connected devices. I must say, this little keyboard is so eye pleasing that I can stare at it all day long . I love it when small things matter the most, yes I’m saying about the dedicated keys for switching devices. It’s so beautiful what they have done. Logitech highlighted these little keys with bright colors, and my eyes have fallen in love with them. I’m attracted to Logitech K380 like a moth to a flame. The highlight of the keyboard is none other than the multi-device support, and it connects to the device faster. This keyboard is so responsive, so we won’t feel any lag, the keys are very delicate, so we don’t have to use pressure when typing. 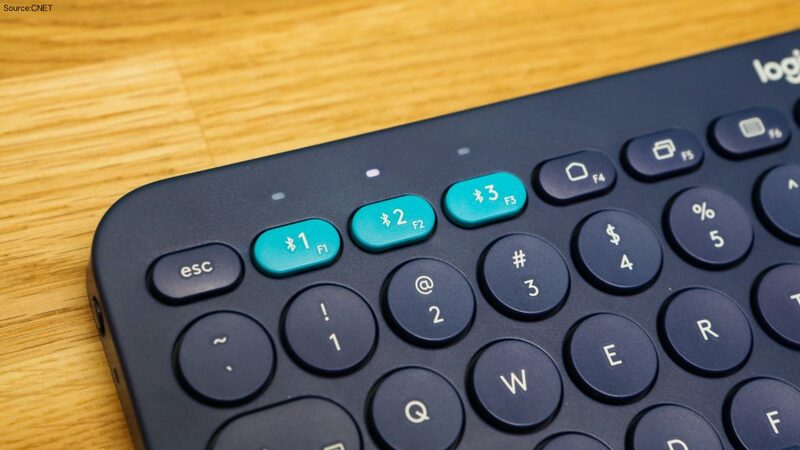 The keyboard is so small and lightweight, so it’s pretty easy to carry around and can fit in anywhere, and one of the first rumors I’ve heard is about the buttons that they are in circular shape and squished together. We won’t be comfortable when it comes to typing. Well, I never had any problems with it, and it only took a few hours to get along with it. It’s made of high-quality plastic, it’s pretty reliable, and you can find the power button on the top left side of the keyboard followed by a LED indicator. You have to toggle the switch in order to turn the keyboard on or off. When we talk about the disadvantages, we can see that there is no home key on the Logitech K380. In this era, most of us don’t use them, but still, it would have been nice if they added them. Sometimes it takes two to three seconds to connect between devices, and in my point of view they could have placed the power button on the upper side of the keyboard, if it does then, it would have been much easier for accessibility. This is a smart piece of innovation in a small budget; it is also compact and rigid. It is mainly built for productivity purpose, so gamers won’t be quite comfortable with it. This is one of the best technology for the traveler junkies out there. When it comes to comparison I find people often comparing K380 with his elder brother K480 one of the next topper in this segment, it has the same features of K380 except for the integrated dock that can hold the tablets or phones firmly and instead of switching keys, K480 has a circular knob and. I am not big a fan of K480 because we generally use keyboards for computers and Logitech K380 is much smaller and minimal. Comparing with K480 I find K380 more elegant . Before we conclude I have one more thing in my mind that I have seen in a forum a few days back. In the forum it says it would have been nice if Logitech added backlight keys in k380, Come On! in this price range guy’s keep dreaming and Yes! maybe one day Logitech will make your dreams come true and hope you can read it from us till then stay tuned. If you have any doubts feel free to leave us a comment. Have a great day.